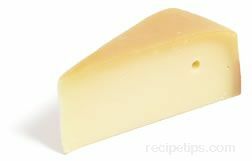 A Dutch cheese made from cow's milk. The rind is a golden tan that covers a cream-colored cheese with a semi-hard texture. This cheese combines the creamy Dutch gouda flavor with that of a Grana Padano, giving it a slighly sharp taste that has both a parmesean and a gouda flavor. It is a good cheese for snacking, as an appetizer, or served with salads and sandwiches.